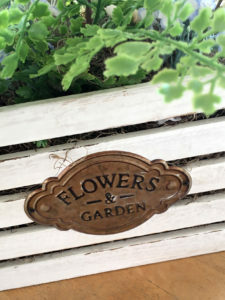 I hosted my first ever CRAFTERNOON a few months ago (click here to see the details of the fun afternoon of crafting, food , and friendship). 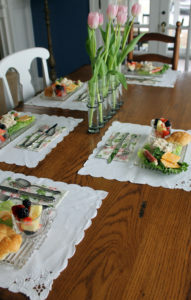 It was such a success that I decided to host another one…this time with a spring theme. 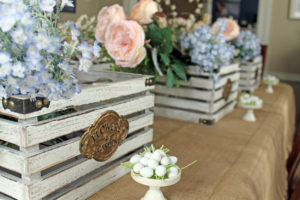 As part of the day, the guests created this vintage-inspired floral arrangements. 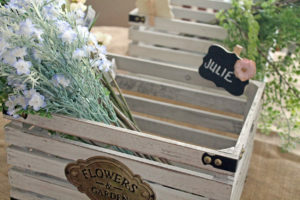 Don’t you just love those white-washed wood containers! 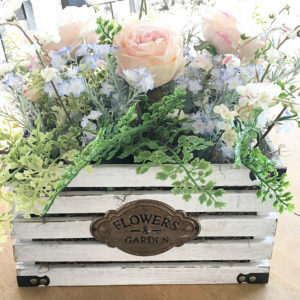 The supplies were set up and waiting as everyone arrived…the wood containers, floral foam, Spanish moss, silk flowers, and greenery. Not to mention a sweet treat of white chocolate malted eggs for each person! After a few minutes of introductions and mingling, the crafting began. 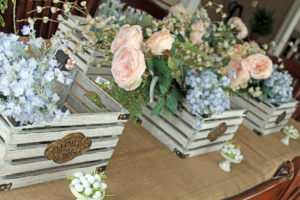 The floral foam was placed inside the containers and then hidden with the moss…that required some strategic placement. 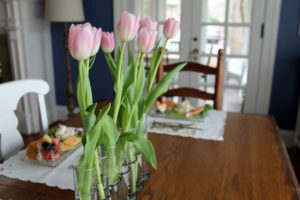 Then the fun part…the flowers! 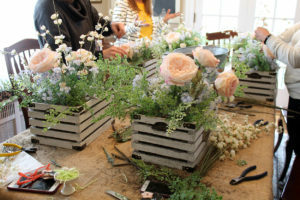 While I offered my sample as a guide, everyone had their own unique way of designing their floral arrangement. 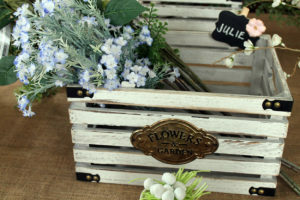 And if they ever want to switch out the flowers or use the wood container for a different purpose, they can simply take out the flowers and greenery. 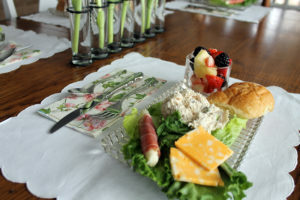 Once the crafting was finished, it was time for a light lunch of roasted chicken salad on a bed of lettuce, fresh fruit, prosciutto wrapped cheese, and a croissant. 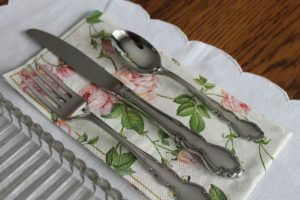 In keeping with the floral theme, the napkins were the perfect accent to my antique glass luncheon sets. 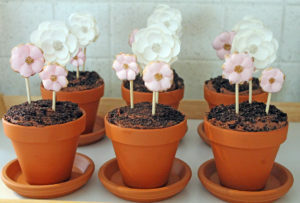 Since this spring edition of the CRAFTERNOON was about floral arrangements, I thought these flowerpot dessert cakes were the perfect ending! Not only were they cute, that chocolate buttercream frosting was delish! 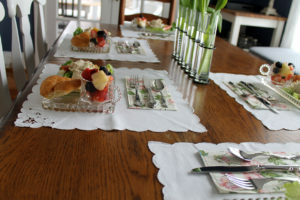 Once again, it was a fun afternoon of crafting, food, and friendship…a CRAFTERNOON! Beth, these pictures are beautiful!!! I really enjoyed myself that afternoon!! 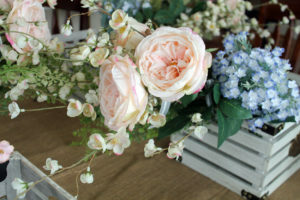 The floral arrangement fits perfectly with my living room decor!! 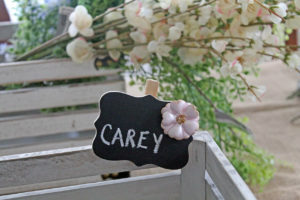 Can’t wait for the next crafter noon!!! Hmmm…..maybe I’ll have to check out the one this summer!!! So glad you were able to come, Carey! 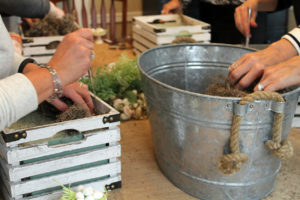 And YES…you should come create a terrarium this summer!!! That’s if you can break away from that new grandbaby!! !